Felted aggregates of acicular to fibrous Yuanfuliite crystals. 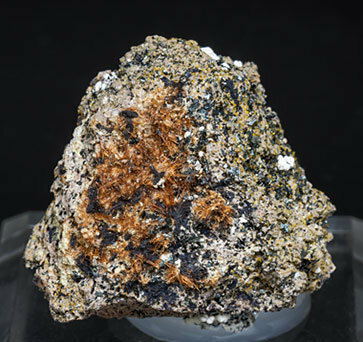 They are bright, have a honey color and they are on a rocky (lamproite) matrix, with Hematite and white spheroidal Calcite growths. Yuanfuliite is a rare borate, identified as new species in 1994 and well described at Jumilla by M. Calvo in 2012 (Minerales y Minas de España, vol. 5, pg. 649-650). 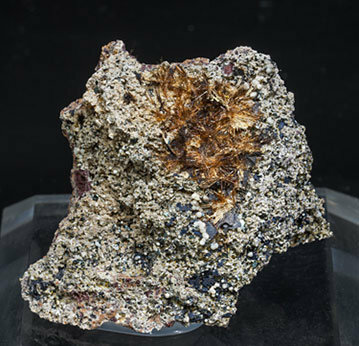 This specimen was published on the Mineralogical Record´s web page, in the ‘What's New’ section, number 43, May 8, 2016 edition. Felted aggregates of acicular to fibrous Yuanfuliite crystals. 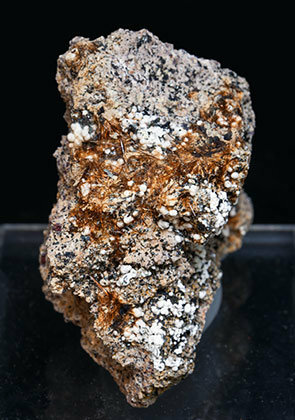 They are bright, have a honey color and they are on a rocky (lamproite) matrix, with Hematite and white Calcite spheroids. Yuanfuliite is a rare borate, identified as new species in 1994 and very well described at Jumilla by M. Calvo in 2012 (Minerales y Minas de España, vol. 5, pg. 649-650).